For nearly 600 years, humans have shown their love for Scottish terriers with artistic depictions like drawings, sculpture, embroidery, and Scottie dog needlepoint. No other canine has captured the hearts of people across the world like the endearing little Scotch terrier. Most of the time, Scotties are used in needlepoint because people wish to celebrate their Scottish heritage in an easily recognizable manner. Using Scottie dogs as the main subject in creative needlework has become a practice that's popular on a global basis thanks to surges in the immigration and relocation of Scottish citizens. The finished needlepoint pieces make great gifts or keepsakes that constantly remind Scots of their history and background. The array of needlework designs centered on Scottie dogs is immense and includes projects like profiles and head studies, groups of terriers, and large format scenes of items or landscapes in which a Scotch terrier is present. If you're interested in creating needlepoint that features the enduring and scruffy Scottie dog, take a look at the sections below for patterns, designs, and Scottish terrier needlecraft ideas. Perhaps the simplest way to find good quality Scottie dog patterns is to purchase them from the many vendors that populate the Internet. These are professionally-designed patterns that you'll be proud to give as gifts or hang on the walls of your home. Needlepoint Heaven: Among their many dog patterns, you'll find an elegant 9 x 11 Scottie dog resting on a sofa. Online Stitch Patterns: The focus lies solely on the Scottie in this pattern. The site's pay and download system ensures you won't have to wait to start working on your pattern. Pegasus Originals: Sew a Scottie with this easy kit from Pegasus' cross stitch and needlepoint section. While it's true that many of the best terrier projects are available through purchase, there are a few high-quality patterns and designs like the ones listed below that are completely free of charge to consumers. No Pattern Required: The proprietors of this free vintage pattern blog offer two similar Scottie dog patterns for viewers to download. The designs are simple in style and easy to sew. Country Cross Stitch Kits: Classic design is the main feature of this full body Scottie dog presented in profile. Includes thread key, charting information, cross stitch chart, and images. Doe-C-Doe: Capture the playful spirit of Scottish terriers with this play scene featuring two dogs and a ball. One of the most important tips to remember as you're searching for Scottie dog needlepoint patterns is that not all designs will use the word needlepoint. 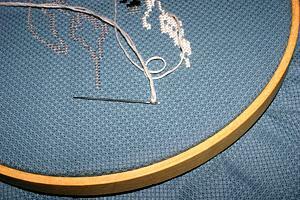 All cross stitch patterns and many embroidery designs are also needlepoint. The best thing to do is to study the patterns, stitch charts, and instructions before you decide if the design is right for needlepoint, especially if the pattern requires a fee.